Rougepout Beauty: Emma Hardie Midas Touch Revitalising Eye Serum - eye, eye. Emma Hardie Midas Touch Revitalising Eye Serum - eye, eye. When it comes to great skincare time is of the essence, in the case of Emma Hardie Midas Touch Revitalising Eye Serum I wanted to give this a long-term trial and it's been part of my routine since the month of July, find my previous introduction post here. Eye, eye, it's time to share my thoughts. I am a cynic about eye products, I have spent longer not using them than I have carefully using my ring fingers to pat them onto my orbital bone. Rarely have had I found any that have made any difference, in fact, those regular readers and viewers of my YouTube channel will know I have found many to be drying on my skin, creating creasing and gathering if makeup is applied over the top. Emma Hardie has been my go-to brand for the Moringa Balm cleanser for many years, so, my hopes were high when I was given the opportunity to sample this. 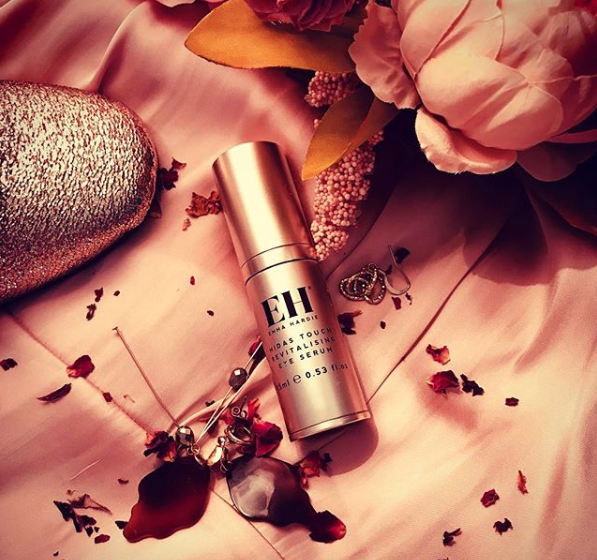 Emma Hardie added to the Midas touch collection with this eye serum and it is skincare gold, giving a silky application of the product to the eye area, this blends into the skin leaving a smooth surface. 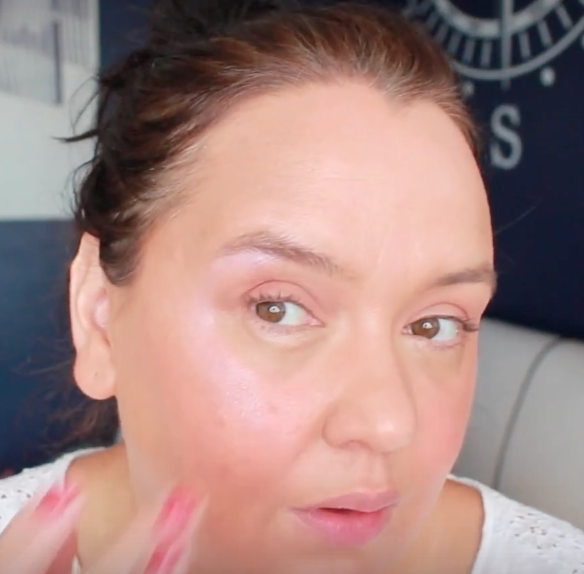 My eye-watering delight was the smoothness of my skin, I had no drying effects at all and as you can see in the picture below, after an application of highlighter, there is no creasing or gathering of makeup. The serum softened some tiny areas of pigmentation on the outer corner of my left eye, my skin looked less tight and my years of squinting were not as obvious, but let's not deny that years of scowling is a harder nut to crack, but, this certainly gave my 'eye' hope again. This light-weight formula makes applying easy, quick and the serum works perfectly both as part of morning and evening skincare routines, I find one pump gives enough product for both eyes and the residue is then added to my frown lines and around the lip area, this, works a treat as the weather gets cooler, no dry lips with this. As you'd expect from a skincare powerhouse, this product does not contain animal ingredients and does not test on animals, there is no mineral oil, synthetic fragrances or colours. The Revitalising Serum does include Beautifeye, this is an extract from the Persian tree of the same name, it literally branches out to deal help with the structure and texture of the skin, Hyaluronic Acid to hydrate, Glycofilm, Sweet Almond Oil - this oil is rich in fatty acids and vitamins it always leaves my skin very soft, Raspberry Seed oil is another fatty acid dream, full of vitamin E and great for keeping skin plumped, of course, 'hello Vera' or Aloe Vera, this is a fabulous product for soothing and cooling the skin. Good things come to those who wait, the review I needed for my own selfish and slightly sceptical reasons to not be rushed, I wanted to really absorb this product on every level and test it out fully, skincare takes time, eye products can be wonderous for a couple of weeks, but, then the novelty wears off, same can be said for much of skincare. This hasn't let me down since July, my eye area that generally dries up at the first mention of an eye serum is still smooth, soft and my makeup glides on. 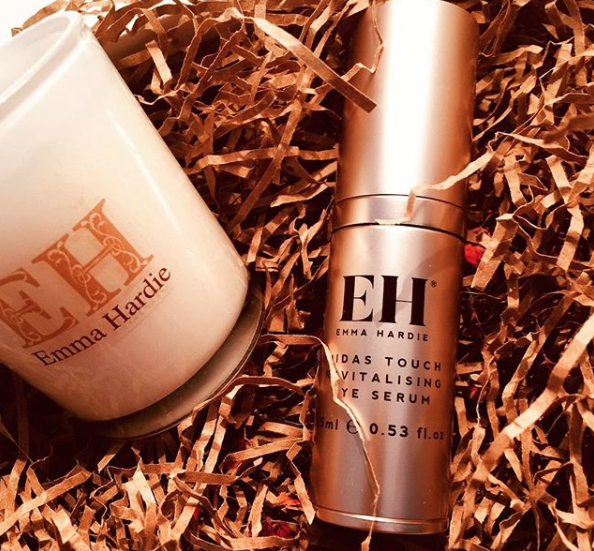 Emma Hardie gives you the answer to your eye serum needs, time to gain the Midas Touch here - the quality of this product and the small amount needed to treat each area makes it a very economical product, here's looking at you kid. Emma Hardie, Eye Serum, Midas Touch, skincare, skincare routine.